May 15, 2013 / P.J. The 28-year-old King has been a professional since her second year playing. King doesn’t participate on the tour full time, sticking closer to her West Coast roots. As a kid, she grew up fewer than two miles from the famed DeLaveaga Park. The setting used to be a place where she would ride bikes. In high school, she dabbled with disc golf as she had some friends who played. The sport didn’t stick right away, though. King played softball competitively during college. But with the seeds of disc golf planted, she eventually found her way back. Then she met some of the people who were behind the scenes, so to speak, at DeLaveaga. Four months into playing, she met TJ Goodwin, the tournament director of the “Steady” Ed Memorial Masters Cup, a PDGA National Tour event. He eventually took King to her first tournament. That first year went fast for King. Still young and new to the sport, she moved through the ranks quickly. She played seven PDGA-sanctioned tournaments in 2005, winning three and never finishing out of the top five. That trend continued in 2006, when she played in 15 amateur events. Of those 15, she won seven — including the “Steady” Ed amateur event. King played in the amateur worlds that year, finishing in a tie for seventh. But in those tournaments she was dominating? King even started hearing the “sandbagger” catcalls. King moved into the professional ranks before the end of the year, playing four events. She even had a win in one of them. It took her time to get acclimated to the pro life, though. Within the first year or so, she scored a sponsorship with DGA. She said she was contacted by team manager Derek Kotval. He inquired if she was interested in being a sponsored player. “I couldn’t ask for a better family,” King said. King’s form of expression appears to be tattoos. And it’s not something out of the ordinary in Santa Cruz, she said. “Everything here is OK in certain means,” she said. “It’s a big place for tattoos and piercings. In all, she says she has about nine or 10. As she also notes, the tattoos don’t define her. She still dresses and acts like a professional when playing disc golf or in everyday life. And it shows a little individualism. There is meaning behind each one — such as music notes on her leg, which show her attachment to what music means to her. Or the disc golf basket, on her right arm, to show her connection to the game. Then there’s “Steady” Ed, the father of disc golf and somebody King never met. Of course, Headrick also was the man behind DGA. His wife, Farina, is still involved, King said. The two of them share a bond. When the idea first came about for a tattoo tribute to Headrick, King said she didn’t want to do a portrait. So, after mulling the idea, she thought about his signature. She sat on it for a bit and said she realized it was what she wanted because, even if she quit the game today, she said it was still a massive part of her life and the tattoo would be very meaningful. One thing King said she wanted to avoid, though, was people finding out. She wanted it to be a surprise, which made getting copies of Headrick’s signature a little more tricky. 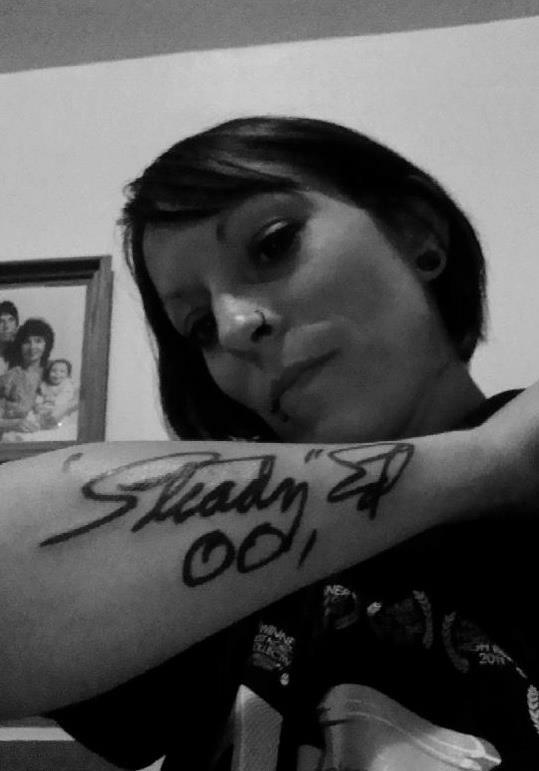 Once her arm was inked, she said Farina Headrick was shown a photo. A month later, when King got to show Headrick the tattoo in person, King said she was appreciative. This sport likely wouldn’t be what it is today without “Steady” Ed Headrick. And no matter where Kristy King goes with the sport, she’ll have a permanent reminder of that and what the sport has done for her.